Heavy micro-component-stereo. Sounds very good. 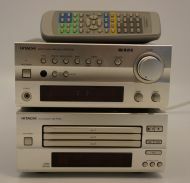 AM-FM Tuner Amplifier and cd-changer and original remote. Luxman set in very good condition from first owner. Turntable works only in manual mode. Heavy and very rare Philips 578, 673 and 572 by Nelson Pass. Very good condition.